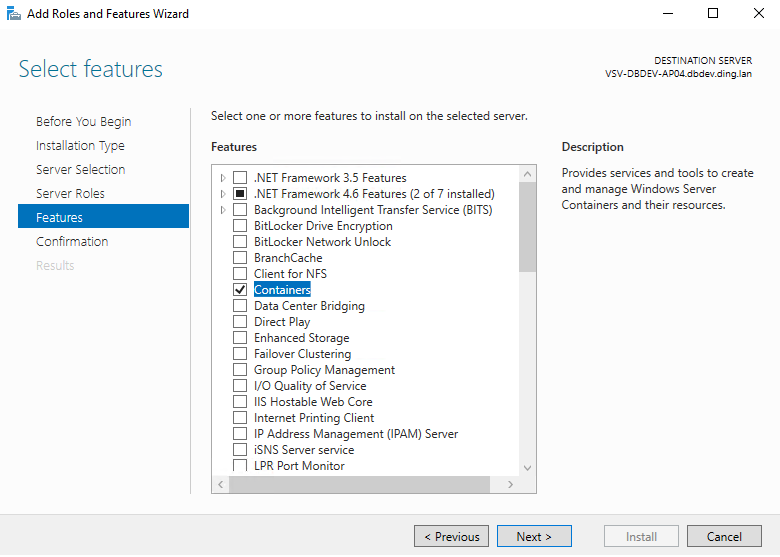 Containers are a hot topic at the moment, there seems to be a new article about them on Hacker News every day and now that Microsoft is supporting containers on Windows Server 2016 I thought it was time to have a look for what that means for us DBAs. The question is can SQL Server run in a container? Well, yes! SQL Server can run in containers. 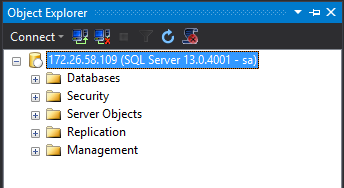 I have to admit that the ability to quickly create new instances of SQL Server without having to run through a lengthy (no matter how much you automate it, come on…it’s quite lengthy) install process is very appealing. This would be very useful for dev/qa environments where they need new instances spun up on a regular basis. So how do you create a SQL container? The first thing to do is get yourself a copy of Windows Server 2016, install it in a dev environment and get it fully patched. Btw Windows Updates are no longer located in the Control Panel options in Windows Server 2016, go to Settings > Update & Security (same as Windows 10 wouldn’t you know?). For simplicity I’m going to be using an installation of Windows Server 2016 with the Desktop. You can do this on a core installation but as i’m used to a GUI, I’ll use the GUI. WARNING! For some reason certain commands fail when copying and pasting. If a command fails try typing it out manually and re-running. N.B.- Notice the values after the -p flag. What this is doing is mapping port 1433 (the default) in the container to port 15789 on the host. For more information have a look here. 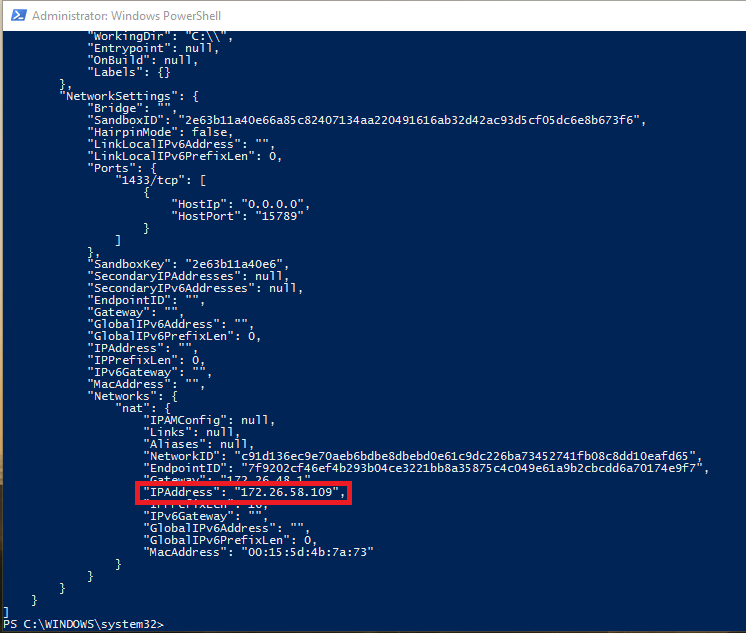 So now we have a container running SQL Server 2016, but how on earth are we going to connect to it? But what about connecting remotely? This isn’t going to be much use if we can’t remotely connect! Actually connecting remotely is the same as connecting to a named instance. You just use the server’s IP address (not the containers private IP) and the non-default port that we specified when creating the container (remember to allow access to the port in the firewall). Hmmm, I imagine you’re saying to yourself. That’s all well and good but it’s a bit involved and I don’t really see what benefit I’m going to get from setting this up. Well, don’t worry, I’ll cover actually using the software and what benefits it brings in Part Two. This entry was posted in Containers, SQL 2016, Windows Server 2016. Bookmark the permalink. Yep, microsoft have renamed the images so have dropped a comment in so that you can search for an image that you can use. Thanks! No problem. I’m chuffed that you’re reading it!